A bright green star with eyes. 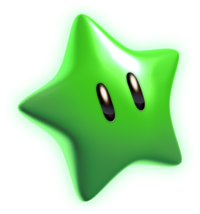 Green Stars are collectible green-colored Power Stars that debut in Super Mario Galaxy. In Super Mario Galaxy, there are only three Green Stars, each of which is hidden away in a different galaxy. Collecting all three of them grants Mario access to the three Trial Galaxies on the Planet of Trials: the Rolling Gizmo Galaxy, the Loopdeeswoop Galaxy, and the Bubble Blast Galaxy. Battlerock Galaxy - Luigi under the Saucer: Rescuing Luigi from a cage in the first level. Buoy Base Galaxy - The Secret of Buoy Base: Under the Buoy Base sealed in a cage which needs to be broken with a Bullet Bill. Dusty Dune Galaxy - Treasure of the Pyramid: Collecting five Silver Stars in the Pyramid Planet. In Super Mario Galaxy 2, there are a total of 120 Green Stars to be found. These are only available once the player collects 120 regular Power Stars and then completes the first mission of Bowser's Galaxy Generator again. Each galaxy has the same number of Green Stars as regular Power Stars (except the Grandmaster Galaxy, which has no Green Stars at all, as collecting all of the Green Stars is required to unlock this galaxy). When collecting Green Stars, the player will have to do a certain mission of a galaxy again. In some cases the Green Stars in a galaxy can be collected in any order (e.g. 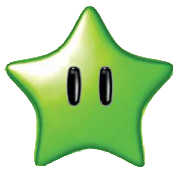 "Green Star 2" can be collected during the Green Star 1 mission), but in general they can only be collected when playing a Green Star mission. Green Stars are usually found in hard to reach or hidden areas of the galaxies. Additionally, the Green Stars only appear when a galaxy is orbited by a Green Comet, which will appear once they are unlocked. Super Mario Galaxy 2's Green Stars make a distinct twinkling sound, which is different from that of normal Power Stars and the Green Stars in Super Mario Galaxy and is meant to help players in locating them. Mario near a Green Star in World 6-1. In Super Mario 3D World, Green Stars function similarly to Star Medals from Super Mario 3D Land and share the same sound effects. Unlike Star Medals, courses can have more than three of them at a time. In Enemy Battles, the player needs to defeat all the enemies to receive the Green Star. In main courses they are scattered around in hidden areas just like Star Medals. In The Adventures of Captain Toad levels the objective is to solve the course's puzzles and to obtain all five Green Stars. In Mystery Houses, the player needs to complete one of the ten-second challenges to receive one. There can be five, ten, or thirty Green Stars in the Mystery Houses. There are 380 Green Stars in total and each of them additionally grants the player 4000 points. Some levels on the World Map require the player to have a certain number of Green Stars to play the level and advance past it. Green Stars also appear exclusively in the Wii U version of Captain Toad: Treasure Tracker. After the end credits, a Green Star is falling across the sky that Captain Toad chases after. The star falls down the Clear Pipe leading to the Sprixie Kingdom from Super Mario 3D World which Captain Toad also enters. Green Stars also appear in place of Power Stars at the end of the Super Mario 3D World levels in the Bonus Episode. Mario getting a Green Star in Buoy Base Galaxy. Luigi getting a Green Star in Boulder Bowl Galaxy. In Super Mario Galaxy, even though only three Green Stars are able to be recovered in the game, a total of seven Green Lumas can be found on the Comet Observatory and the Planet of Trials (counting the one that takes Mario to the Grand Finale Galaxy). Green Lumas grow up to become Green Stars, according to Polari. When a Green Star mission is chosen in Super Mario Galaxy 2, the borders of the screen are green instead of black. This page was last edited on April 15, 2019, at 18:34.